FORKLIFTS: In future, they may not need operators. 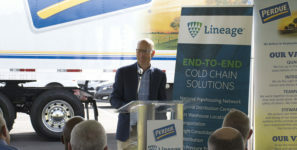 Partnership seeks to automate warehouse vehicles. Vehicles and robots to communicate with each other to prioritize warehouse workloads. Autonomous forklifts in a warehouse could communicate with each other to make decisions on tasks and navigation. Technology development for smart forklifts and trucks that communicate with each other is underway at Rochester Institute of Technology where a team of engineers is building a next-generation intelligent materials handling system. The research project focuses on the design and prototyping of intelligent systems for a fleet of autonomous materials handling equipment to advance warehouse productivity and safety. “In terms of automation in warehousing, the most expensive thing is labor. Looking at automating warehouse processes, an automated vehicle could be working 24/7. This can be beneficial for companies to increase productivity and safety. This is a research project that is for developing new material handling methods potentially benefiting the whole industry,” Kuhl said.